Play Along with a Full Symphony Orchestra!. Composed by Various. Instrumental Play-Along. Disney, Movies and Play Along. Softcover Audio Online. 24 pages. Published by Hal Leonard (HL.841411). ISBN 0634000756. 9x12 inches. Book/Online Audio. 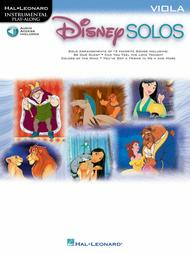 12 Disney favorites with online audio recordings that let you play along with a full symphony orchestra! Titles include: Be Our Guest • Can You Feel the Love Tonight • Colors of the Wind • Friend like Me • Let's Get Together • Under the Sea • You've Got a Friend in Me • Zero to Hero • and more. This book gives the violas a chance to get the melody, however, was alittle easy for my taste. Not all of the songs when played were that recognizable. A good portion of the songs were just fun little quirks to the end of a long practice time. These were way fun songs to play. I liked to pull out this book for the dessert of my practicing session, and reward myself with some fun after all the work. 20 of 48 people found this review helpful. to intermediate level and if you like disney songs. overall, definetly worth it! These were easy for me because of my playing level but they really are a challenge for some people.great if u just want to have fun! The sheet music is fun. I wish the CD had viola only so i could compare.